A street shot of pedestrian friendly London. Photo by *Berto from Flickr. During the months of March and April I lived in pedestrian-friendly London, the biggest of the half-dozen cities around the world that now impose a congestion charge on motor vehicles entering the city during daytime. London’s congestion charge currently stands at £8 ($16) per day, and it has been very successful in (a) reducing the amount of traffic in the city by about 30%, and (b) raising significant revenues to support upgrading of the city’s mass transit systems. In my view, the congestion charging has also considerably improved London’s quality of life. I stayed for a month in a club near the British Museum that had four Underground stations, on three different lines, less than a 12 minute walk away. 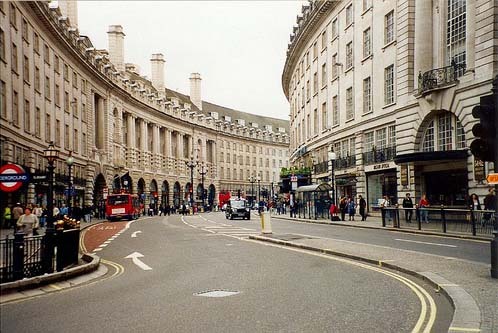 Throughout the whole of Central London there are great pedestrian accommodations, as well as extensive networks of bike- and bus-lanes. Some streets have been completely pedestrianized. On others, only buses and taxis are allowed. Sidewalks throughout the city center have been broadened. Pedestrian crossings are numerous and large, and have satisfyingly responsive pedestrian push-buttons. Many businesses have responded well to the high volumes of pedestrians on the streets. Pubs would have a bustling clientele spilling out onto the streets for many hours of the day; new restaurants, retail boutiques, and small businesses had proliferated around the Underground stations. London has become a magnet for young people from all over Europe. It definitely had a polyglot new liveliness, and the late-evening streets seemed safer than they did back in the 1990s.